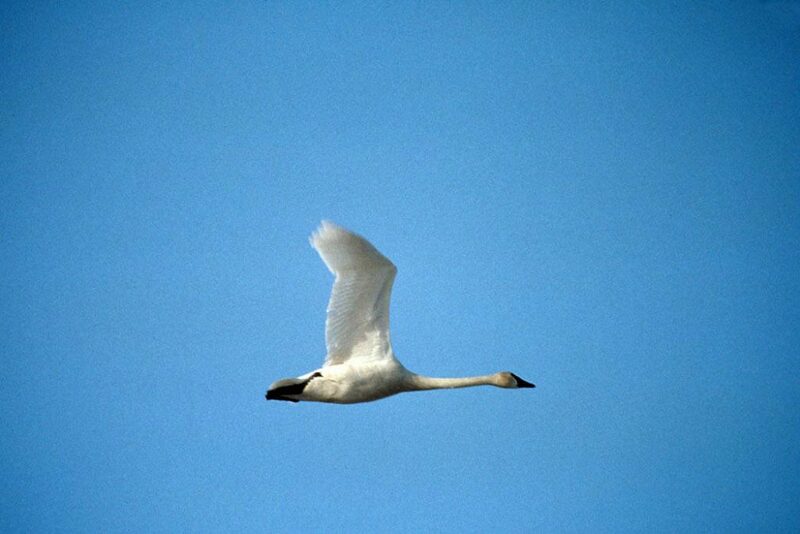 Flying from distances as far away as the Arctic, the birds that make their home in Currituck County during the winter attract birding enthusiasts nationwide. If you’ve ever wanted to see elegant tundra swans, snow geese, and majestic American bald eagles, make sure to add Mackay Island National Wildlife Refuge to your beach vacation bucket list. December and January mark a peak time for waterfowl at Mackay Island, which is part of the Atlantic Flyway. The marshes and wetlands within the refuge become a hub for thousands of migratory birds and waterfowl, including mallards, American black ducks, American widgeons, green-winged teals, gadwalls and northern pintails. “Mackay Island is a key stopover habitat and wintering grounds for a lot of birds,” said Mike Hoff, refuge manager. It’s no wonder Currituck County is one of the best places for bird watching and birding. Mackay Island National Wildlife Refuge has been a safe haven for migratory waterfowl for more than 55 years. Located on Knott’s Island along North Landing River, the refuge spans roughly 8,500 acres. From mid-March to mid-October, visitors have access to the hiking and biking trails within the refuge. Depending on the season and month, people are allowed to fish for largemouth bass, crappie, and bluegills. If you drop a line from the bridge on the causeway that leads to the refuge, you might catch red drum, striped bass, and flounder. During the winter, access to the refuge is limited but visitors can still hike a one-mile public road that leads to the front gate. This protects the habitat while still providing the public an opportunity to witness the thousands of ducks, geese, and swan that winter here. Visitors can enter the refuge via two routes. From Virginia Beach, Virginia, follow Princess Anne Road until it becomes NC Route 615. From North Carolina, you can take a ferry from Currituck Courthouse on US Highway 168. The ferry, currently free, takes passengers and their cars to Knott’s Island. Both routes lead to the refuge entrance. Perhaps the biggest draw to Mackay Island National Wildlife Refuge is to catch a glimpse of the elusive and secretive King rail. Renowned for its population of King rails, the refuge has the highest nesting density ever recorded of King rails, according to a recent study. 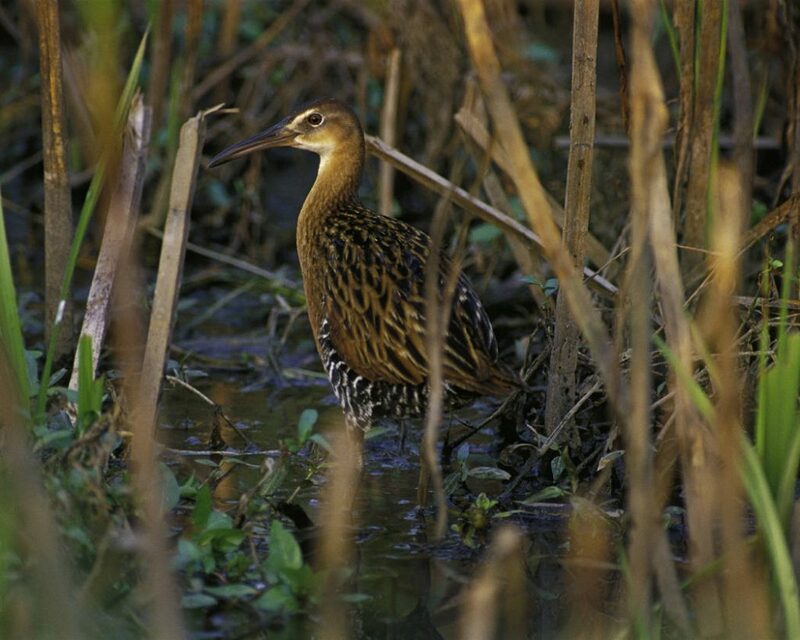 “The most unique thing about Mackay Island is the King rail population that we have here,” Hoff said. Although adult King rails are about the size of a small chicken, it’s rare to see them. A good strategy to see the King rails is to search for them in the morning on a day when the water is low. King rails will stand on the mud flats, looking for crayfish to eat. Using their long and slender beaks, King rails pick off the shells to reach the meat. Take nothing with you but pictures and great memories. Please do not remove any plants, flowers, stones or other parts of the refuge. Leave nothing behind. Please do not litter. Do not leave leftover food to decompose. Take trash with you. There are no designated trash cans. It might not seem like a big deal to skip rocks in the refuge, but it has long-term consequences. When people constantly pick up rocks and throw them, it changes the soil composition at the bottom of the pond. This, in turn, affects the fish, mussels, and wildlife that live there. Any form of disturbance can bother the fragile ecosystem that exists within the wildlife refuge. This includes loud noises. Leave Fido at home or keep him on a leash. If you must bring your dog, use a leash at all times. Don’t forget to pick up after your pet. Horseback riding is prohibited. Looking for more great ideas on how to spend the winter in the Currituck Outer Banks? Download our free visitors guide today!